::: tip This is Part 3 (of 4) of the Hong Kong Contemporary Architecture Guide. Sci-fi dystopian movies tend to depict its cities as layers upon layers of tall buildings and structures. The ground level is usually dark, chaotic, damp, where the rain seems to fall continuously. Up above, huge, 3-dimensional billboards share the airspace with flying machines, highways and the pinnacles of skyscrapers. 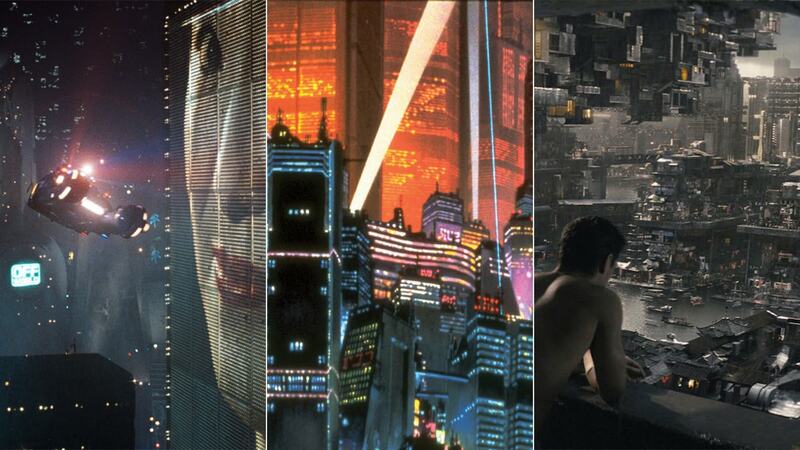 Movies like Metropolis, Blade Runner, Akira, Total Recall, Minority Report, to name a few; all show similar urban spaces to depict the future we will live in. The latest adaptation of the manga classic Ghost in The Shell is part of that group. It is set in a dystopian future, where the urban environment is dark, wet, and damp, yet painted by lights and holographs. The main character, Major, is always perched on top of skyscrapers, listening to the city below. Every once in a while, she dives into the city's darkness below to do her tasks and missions. And wonderfully enough, most of the city in the movie is Hong Kong. Hong Kong is the perfect scenario for all this. It is easy to look at the city and imagine a future where highrises multiply in quantity and height. A future where the city lights become three dimensional, the days are always dark, and the rain never stops falling. Even modified and enhanced by computer animations, you can easily recognize Hong Kong in the movie. From the Island skyline in the background of a boat scene on the Bay to the butcher shops in Kowloon, or the evil headquarters at the Lippo Building While watching the movie, three places caught my eye and made me want to explore further. The background of a fight scene showed a mass of residential buildings. 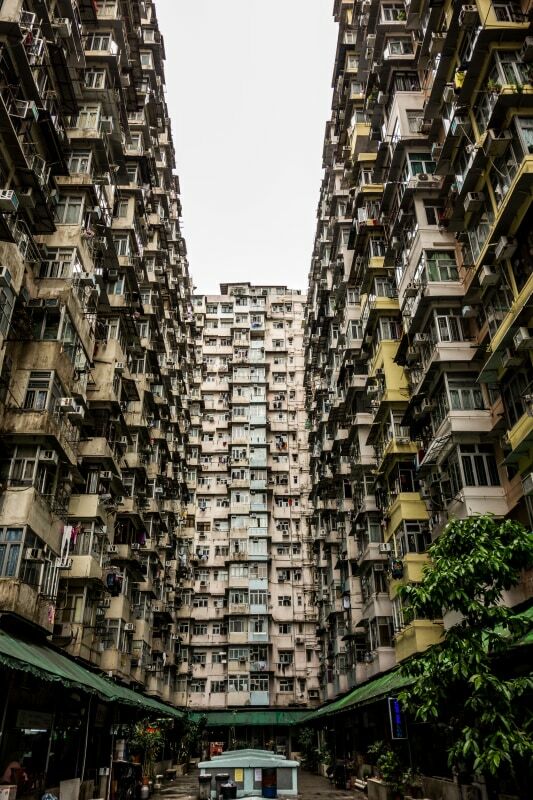 I later learned it was a montage composed of several residential buildings in Quarry Bay. The Montane Mansion is the most famous and picturesque among them. 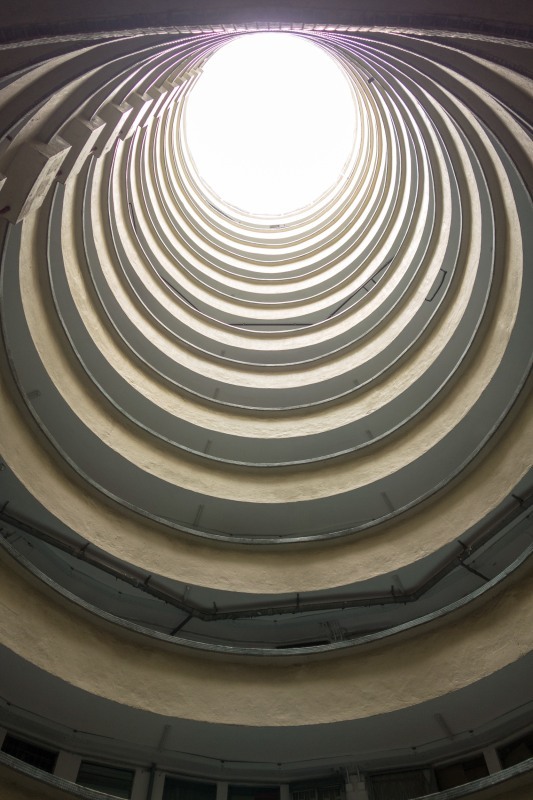 Another scene showed a deep circular atrium in a residential building. It was easy to identify it on the map as the Lai Tak Tsuen, in Causeway Bay. Finally, a scene set in a peculiar cemetery. 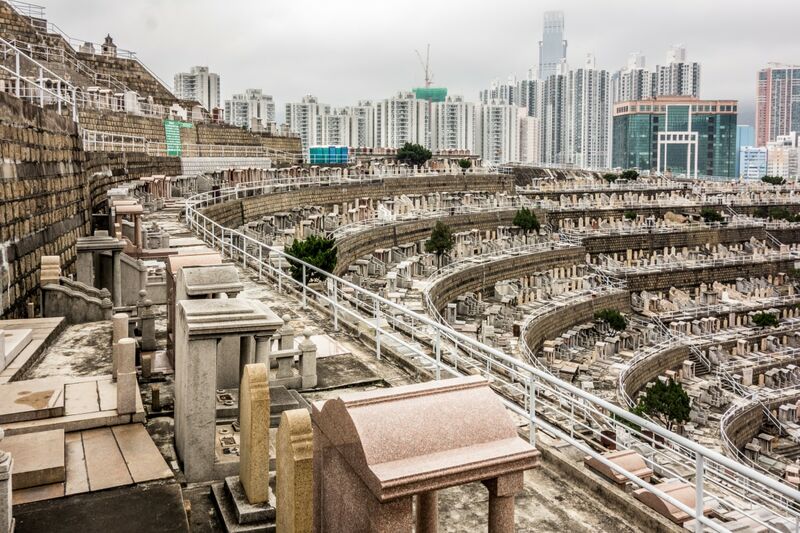 I knew I saw that before: Tsuen Wan Chinese Permanent Cemetery, visible to anyone on their way to and from the airport. Although the movie inspired this guide, these places are on their own worth a visit. They are great examples of architecture that usually go unmentioned in most guides. 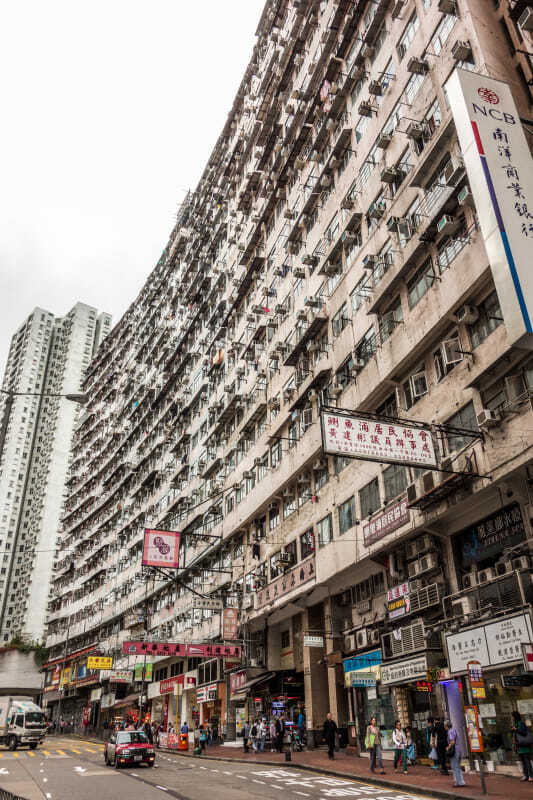 The Montane Mansion is a massive residential complex in Quarry Bay, home to over 10,000 people. It was built during the 60s and completed in the 70s by the government to help curb the post-war residential crisis. It is an example of a Hong Kong "composite building": a building that houses commercial activities on its lower floors and a mix of commercial and residential programs in its upper floors. 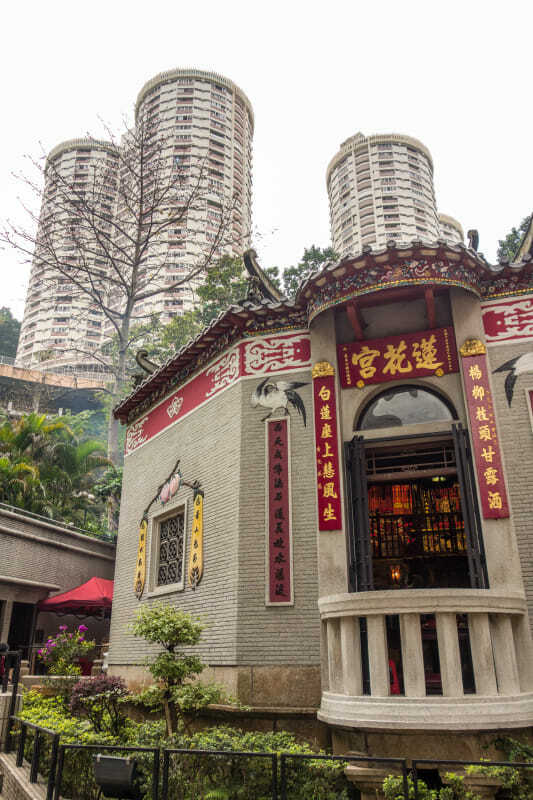 A famous example is the Chunking Mansion, where you can find cheap hostels, restaurants, shops, and apartments in one single large building in Kowloon. But contrary to the Chunking Mansion, the Montane Mansion in Quarry Bay is a photographer's paradise. Its main north facade follows the street curvature and rises more than 15 floors with no setback from the street. With an E-shaped floor plan, the building has two courtyards. These are narrow, long and tall. Looking up, hundreds of makeshift balconies and bay windows extrude out and hang from the building, almost closing off the airspace. The sheer complexity and height of this space are astonishing. It is no wonder it became an Instagrammer's favorite. In the movie, it was the backdrop for an exciting fight scene between Major and one of Kuze's victims. You can see it in the trailer above at the 0:46 and 1:16 marks. As the ground floor is mainly commercial, the building is accessible to the public. You can walk around it and explore all its crooks and crannies. You can access the courtyards through the main north entrances, or from the south alley. It is mainly a residential building, so you should show respect to its inhabitants when visiting its inner courtyards. 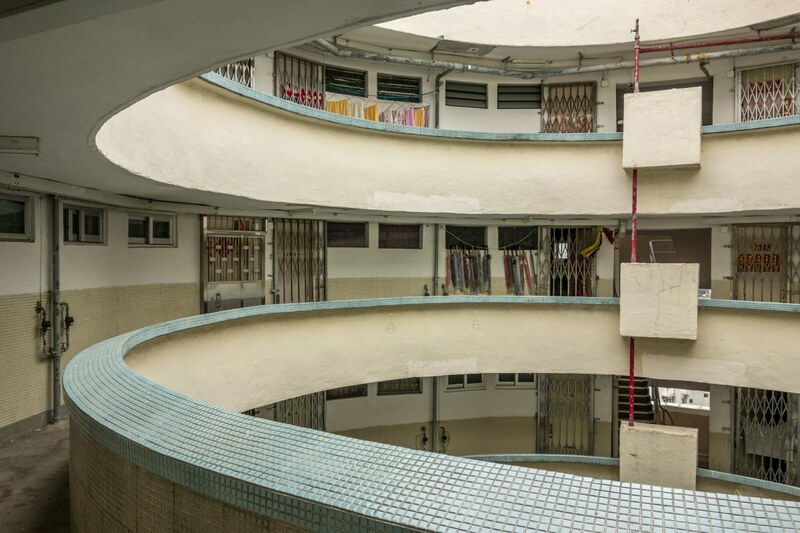 The Lai Tak Suen buildings were among the first public housing developments in Hong Kong. 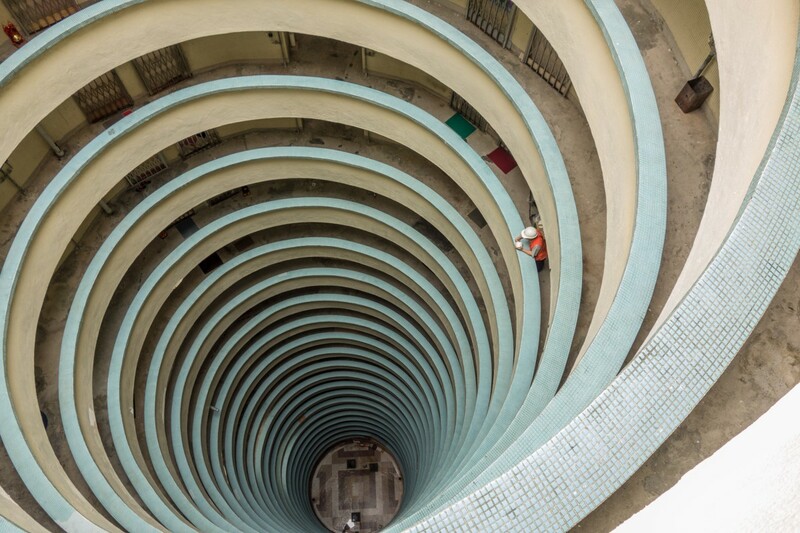 Built in 1975 by the Hong Kong Housing Society, it is composed of three building where over 11,000 people live. 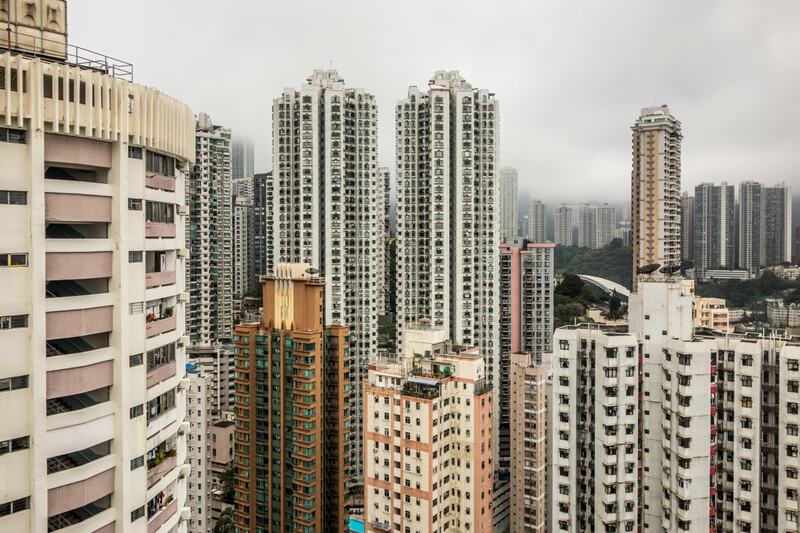 The cylindrical buildings stand on the hills of Wan Chai, south of the Victoria Park. Although outstanding from the outside, their interior circular atriums are the biggest surprise. These are 25-story deep atriums, open at the top and lined with circulation balconies. The light yellow balconies, covered in blue tiles at their rims, form a rhythm of rings that, seen from the top, gives an exceptional graphical quality to the space. Seen from the bottom, they lead to the circular opening at the top, guided by one single vertical line formed by the fire extinguisher boxes. It is beautiful and unique. In the movie, the atrium is in a scene when Major goes to visit another character's home. It surprised me how easy it was to enter the residential compound. There is a guard, but he seems not to worry about who is coming or going in the building. I came and took the elevator up to the last floor, no questions asked. However, as a residential building, due respect to its residents is, of course, expected. The Tsuen Wan Chinese Permanent Cemetery was inaugurated in 1941 on the hills of Tsuen Wan in the New Territories. You can spot it on the way from and to the airport. 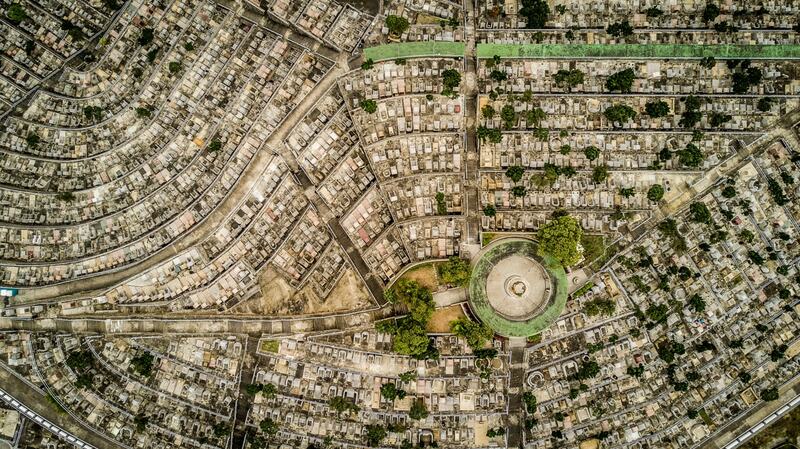 Its graves lie on terraces carved into the mountain. It is surrounded by highrises on one side and the sea and port on the other, forming an entirely strange and surreal scenario. It was used in one of the last scenes in the movie, with very little modification. You can see it at the 0:55 mark in the trailer above. The cemetery is open to the public from 8:30 am to 5 pm every day. There are some subway station around it, but you'll have to catch a bus or a taxi to reach it. The views from the top are beautiful and unique. It is also moving to watch families visiting the graves of their loved ones, leaving offerings and praying.